Driver’s education classes are a necessary evil. While they have proven to lower the number of accidents and tickets teens are involved in or receive, these classes are undeniably boring. However, your driver’s ed class may have featured an unexpected treat: educational Disney cartoons featuring Goofy. Even half a century later, these animated shorts from Walt Disney are as relevant as they were when they were released. In this six-minute short directed by Jack Kinney, Goofy (or Mr. Walker, as he is referred to in the video) functions as an Everyman to show how a pleasant, good-natured person can lose control behind the wheel of a car. As he transforms into the aggressive, self-centered Mr. Wheeler, Goofy becomes a dangerous driver caught up in the belligerent traffic. This cartoon, a whopping 65 years old, illustrates that road rage was a recognizable and serious problem far before our own generation. Because of its treatment of road rage through a Jekyll/Hyde approach, it received the Buyer Trophy for the best film on traffic safety. Shortly after its release, the Oakland, California Police Department contacted Walt Disney for a copy to show traffic violators, starting a wave of schools and police departments requesting 16mm copies. This animation depicted Goofy with a different appearance than previously, including the absence of his long, floppy ears. The car he drives is based on a Lincoln-Zephyr convertible. Also released under the name “The Art of Driving the Super Highway,” this educational video was created by Walt Disney Educational Media to address the outdated aspects of “Motor Mania,” now 15 years old. 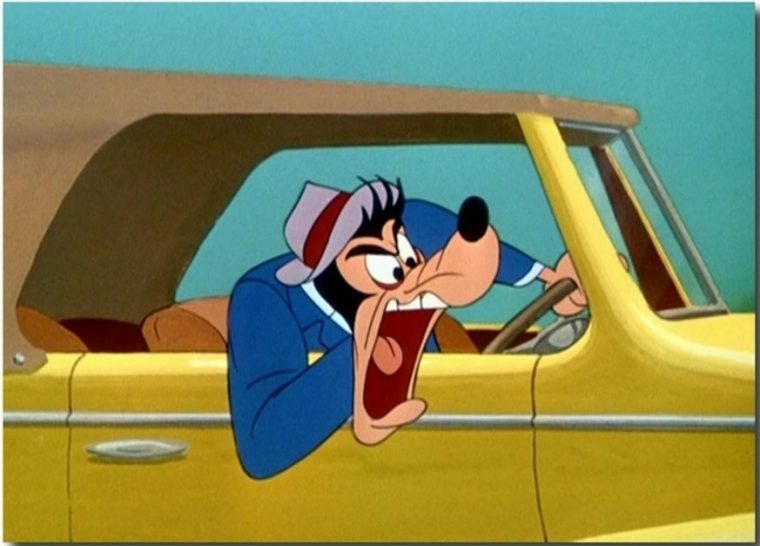 In it, Goofy is depicted as three different types of highway drivers–Driverius Timidicus, Motoramus Fidgitus, and Neglecterus Maximus–all equally dangerous for their reckless driving habits. Due to “Freewayphobia”‘s length, it was divided and part of it released as “Goofy’s Freeway Troubles,” which addresses the mechanical aspects of driving on the highway, such as gasoline needs and storing cargo. Both segments near a 15-minute run time. These cartoons were also released in theaters and have become staples in driver’s education classes.